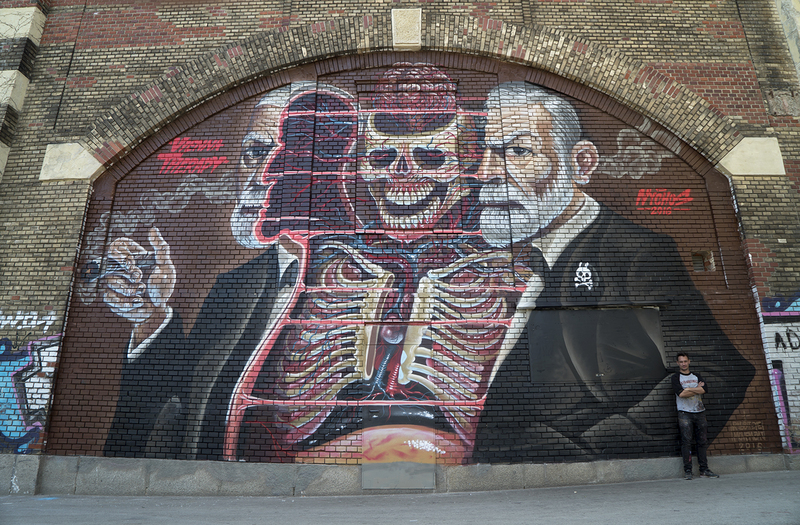 NYCHOS dissected Sigmund Freud, the father of psychoanalysis. On paper, on a wall…and in the 3rd dimension. The art installation “Dissection Of Sigmund Freud” – Nychos’ biggest 3D sculpture so far – is going to be exhibited between June 16-18 in the course of Vienna Therapy, a project by Wien Tourismus on the Flatiron Plaza, New York. Only a few days later, the artists going to open his upcoming solo show IKON at Jonathan Levine Gallery, New York, where the illustration to the sculpture will be shown. Save the dates, if you’re in town. And keep your eyes open – Nychos will definitely leave some murals behind. This guy is on fire.